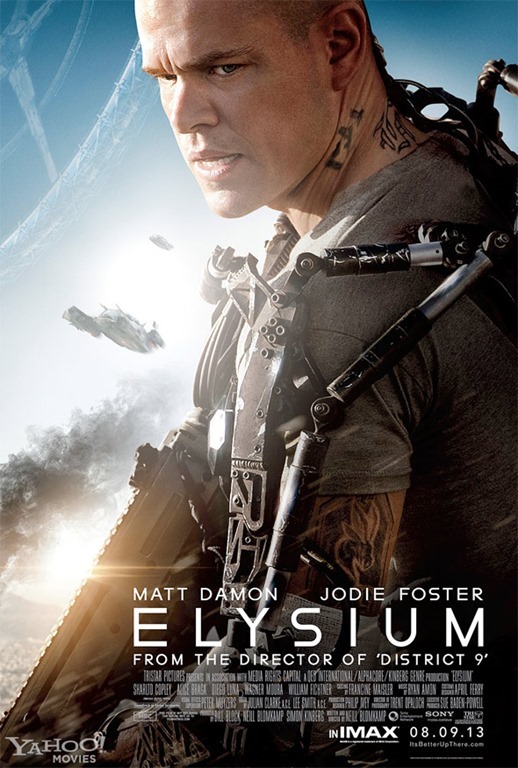 First, let me say this: I haven’t seen Elysium, and likely won’t. At least, I won’t pay good money to see it at the theatre. Maybe I’ll watch it when it comes out on HBO or Starz. Maybe. I have, though, read a number of reviews, and they all seem to point to the same theme. Elysium, like every collectivist and anti-capitalist book or movie that’s come before it, appears to ignore one simple fact of reality: the more freedom people enjoy, the better their standards of living. That is to say, the more capitalist a society, and the more individualistic, the better off everyone has tended to be. It’s no coincidence that, even with our current economic woes and mixed economy (part free, part statist), Americans are better off than just about anyone else on the planet. Blomkamp’s “Elysium” is a cautionary tale about what happens if all the good gear winds up closely held by the elites of society. Ironically, here in our real world, the clear trend has been toward technology as a widely self-proliferating and disruptively democratizing force. The irony here is that Obamacare is now supported by virtually nobody but the current administration, and it was never the wealthy who opposed it. Almost all of the pressure groups that pushed for its passage, including the unions (! ), are now against it, seeing it as unworkable, obscenely expensive, horribly inefficient, and not conducive to the health of American citizens. Looking around the world, it’s very easy to see that where collectivised (i.e., “national” or “universal”) healthcare exists, care is atrocious where it’s even available. Sure, you can read arguments to the contrary about some Scandinavian countries, but they’re reversing course themselves, quietly, and so those arguments are hard to believe. Yes, the generally superior American healthcare system has its issues, but it’s also been one of the most highly regulated industries since the 60’s, and government has generally formed its character for almost a century. Why do employers provide most healthcare “insurance,” for example? Well, because government made it a tax deductible benefit back in the day. How did it turn into something other than actual insurance (after all, our auto insurance pays for accidents and catastrophic events, not maintenance and wear-and tear)? Well, because companies figured out early on that juicy, government-subsidized (by virtue of being tax deductible) health insurance benefits were a relatively cheap way to attract employees. And that’s only the tip of the iceberg. Don’t get me started on Medicare and its impact on massively expensive, end-of-life interventions. In short, it’s not capitalism, that is, a socioeconomic system that recognizes and secures individual rights, that has caused the problems we face, but rather it’s been government all along. If it’s truly the 1% vs. the 99%, then the 1% is the political class, not the economic class. I point out the Obamacare reference above only to illustrate the point. Really, the idea of Elysium in general is nonsensical to me unless one accepts that force would be required to put it into action. How else could such a perversion exist, especially given the salient point made in the quote that technology has actually done nothing but made all of our lives better at ever-decreasing price points. But what agency is able to use force, widely and legally (as the agency itself defines it)? Clearly, that agency is government, which is defined as that entity within a given geographical region that has a legal monopoly on the use of force. Consider that America has a mixed economy, where corporate cronies get favors from government in terms of tax incentives, subsidies, price protections, Obamacare waivers (there it is again), and a myriad other means of using political force to confer economic advantage. But again, that simply demonstrates the same point: it’s the government, stupid. Take government force out of the equation, and every company has to compete on its own merits–which means providing superior products at attractive prices. Any initiation of the use of force (or its variants, such as fraud, extortion, etc.) in a rational society would be met swiftly by the legitimate retaliatory use of force by government. But all of that’s just idle speculation, since reviews imply that the movie doesn’t explain any of it. Nor does the movie seem to take into consideration anything that has already been historically demonstrated, without a reasonable doubt, and so trying to put Elysium into some kind of sane historical context is impossible. Our society certainly looks nothing like Elysium–the vast majority of Americans, particularly productive Americans, have been doing just fine, thank you, particularly if you compare their standard of living to that of the vast majority of human beings who’ve ever lived. Granted, more of them are unemployed today because of a massive economic collapse caused by government’s manipulation of the financial and housing markets, but that’s fodder for a different discussion. If I’m missing something here and you think I should go see the movie to form a valid opinion, let me know in the comments. I’ll pay a few bucks to make sure I’m not presenting an invalid argument. But absent such assertions, I’ll stick with my current interpretation. I’ve seen enough of this kind of leftist propaganda to be able to predict with some accuracy what its central theme is likely to be. On a side note, Matt Damon is an idiot. I just thought that needed to be said. *Update: I read a few more pieces about the movie, and it seems that manufacturing and such might indeed happen on a (virtually, at least) enslaved Earth. So it’s even worse, in that it opens up many more questions about why an entire global population would slave away producing technological goods for Elysium (unless force is involved, of course), why they wouldn’t use some of it for themselves, and it still doesn’t answer the question of where the technological advances came from. Slave labor doesn’t exactly innovate, after all. Mark, you don’t have to see Elysium. Your insights and analysis couldn’t be better. Elysium is a mash-up of sick people and violent action. Health care or more accurately health insurance is not a right and will never be a right. Rights do not require the enslavement of others for one’s benefit. Someone will have to pay for the doctors, nurses, technicians, pharmaceuticals, and medical equipment needed to provide this so-called right. The real dirty little secret of our health system is that young healthy people are being forced to pay for old sick people to live another two or three years. Agreed completely. It’s ridiculous that nobody on Elysium is smart enough to actually start trading with Earth, considering the huge market that the latter provides.